We have two posts today.. so if you are looking for the Friday Challenge winners scroll down to the earlier post. This sketch will be perfect for our 2-inch square stamps, including some of our new Christmas collection stamps or monograms. But remember, you can always cut any shape of our stamps into a square to use with this sketch! Your project doesn't have to be a card — please feel free to interpret the sketch however you'd like, into whatever kind of project you prefer! Since we were working at CHA all week – we will be sharing our inspiration project for the sketch a little later this week. This week's challenge winner will receive a $50 JustRite gift certificate and three Honorable Mentions will receive a $15 gift certificate. You will then need to link to your project back here on our blog post, using the linking system on this challenge post. Please make certain your link is directly to your project, not just your general blog home page or overall photo gallery, so we can find it easily. (Links that are spam, commercial in content, or are not linked properly/directly to your project will be deleted). If you choose to upload your project to www.Splitcoaststampers.com OR our Flickr gallery, please use the weekly challenge code (example: JRC_029 <== that's an underscore between the letters and numbers) in the keyword section of the Splitcoast project upload page or the Tag section of the Flickr gallery. You will have until next Thursday, August 5 at 9am Central to make your project and enter a link to it below. Then the winners will be chosen and announced a little later that day here on the JustRite Inspiration Blog. 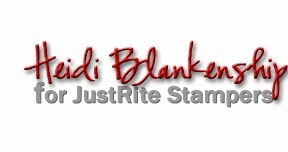 By entering our challenges, you grant JustRite Stampers permission to use your artwork here on our blog as well as our company website gallery (with designer credit given and your blog post or gallery linked) or any possible advertising. We can't wait to see your projects using this sketch! We are back from CHA!! What fun we had meeting everyone!! Thanks for patiently waiting for this week's contests results!! We will be back shortly with our next Friday Challenge Post. Cheryl Gramling created a wedding album for a friend and use our challenge as inspirtaion to use a photo that she couldn't fit in the album to create this fabulous gift card to go with the album. What a personal gift Cheryl!! Patti Goldman used a photo she took on a field trip with her daughter to a butterfly exhibit at the Smithsonian Museum of Natural History in Washington. What a great way to capture the memory and share that special day with a friend!! Sherri H created this mini album as a special gift for her mom. This is the front cover of the album and captures the spirit of the mini album. Congratulations Ladies!! And a huge thank you to everyone who played along with our challenge- as always you make our job picking winners harder every week!! Thanks for all the inspiration!! Please contact us by email to receive your prizes!! "I love the idea of Christmas in July! For this card, I stamped five of the wonderful images from the From Our House set and colored them with Copics, accenting with glitter pens. I used a square punch on each image, then punched out squares of colored card stock that I had embossed. I then created a custom sentiment with the Trompe Script Lowercase Font set and stamped it on some twill tape for a nice country Christmas look, finishing off with a bright red button." "For solid color card stock, I use mostly Stampin' Up! and for designer paper I will use just about anything that catches my eye. I'm always amazed at the array that exists out there and you can never have too much paper, though it's a challenge figuring out where to store it all!" "I am currently addicted to making my own ribbon embellishments. With just a needle, thread, and some pretty ribbon, there are a whole host of nifty decorations one can create." "If I had to choose, my favorite crafting season is Spring. After a long, cold winter, I always love seeing all the new, pretty colors and there is always a feeling of freshness in the air." Well, Regina, your week with us has certainly been as refreshing as Spring, here in the middle of the Summer! Thanks so much for sharing your wonderful talents with us! Remember, you have a little longer this week to enter our JustRite Friday Challenge — until midnight Central tomorrow, as we'll still be at the Craft & Hobby show until then. We'll post the winners of the challenge sometime on Friday and you can look for a new challenge on Friday as well! "I have a teeny, tiny little corner of our Manhattan apartment as my stamp area, though when I create, my tools and supplies usually spread their way everywhere. Sometimes the clean-up takes longer than the stamping!" "I am a tool nut. If it's new and cool, I want it. But, the one tool that I could not do without is a sharp hobby blade. I use it for anything from paper-piecing to attaching embellishments. I love to cut out images and a sharp blade is an absolute must!" "I started blogging about the same time I got serious about stamping. I thought it would be a fun way to connect to other stampers and to share my work." "Masculine cards can be a challenge, and for this one I tried to keep things simple yet visually interesting. I first die cut circles through my chocolate card stock as well as my card base to create a window. Next, I framed the window with a border from Friendship Borders & Centers, die-cutting it out and then adhering it to the card. I then wove ribbon together to embellish the bottom of the card. I stamped the center image from the same set onto a wood sheet and die-cut it out, sponging the edges for a rustic look. To make the image seem to "float" in the window, I used a thin strip of acetate to attach it to the card." Absolutely fabulous, Regina – the stamped image looks like it was heat burnished into the wood! Don't forget to check back tomorrow for our final day with Regina! Please Welcome Guest Designer, Regina Mangum! Our Guest Designer this month is Regina Mangum. You'll probably recognize Regina's work as winning many of our Friday Challenges! 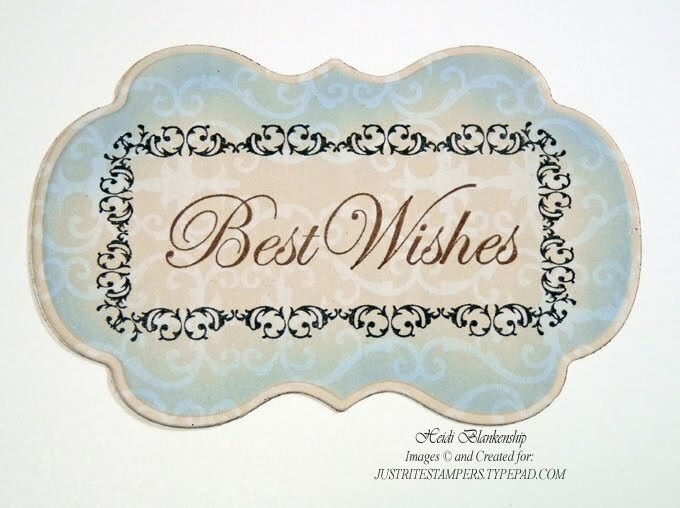 You can stop by Regina's blog, The Stampin' Bean, to see more of her beautiful artwork. "I am originally from Los Angeles, CA. We also lived for a time in the Midwest, and now make our home in New York City." "I am married to the funniest man I know and we have a little boy, who will turn three this Fall, and who is turning out to be just as funny as his Dad. He often appears in my card and scrapbooking projects." 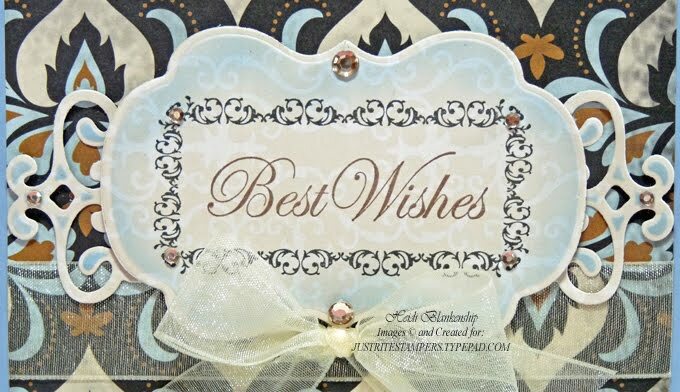 "I've always enjoyed making my own greeting cards, but I became serious about stamping a little over a year ago." "For this floral and feminine birthday card, I wanted to accentuate the pretty script of the sentiment from Baroque Nested Frames & Occasions. First, I stamped the sentiment onto a piece of cream card stock and set it aside. Next, I stamped the nested borders from the same set on pink card stock and used a sharp hobby blade to cut out the center and then cut around the larger, outer border. Using foam tape I popped this over the sentiment to frame it. I added some paper flowers, adhering buttons, and added an elegant stitched satin and pearl accents. Finally, I sponged ink over designer paper to match and assembled the card." So gorgeous and feminine, Regina –love the cutout frame! We hope you'll join us tomorrow for Regina's second project — a very opposite masculine themed card! This week's Friday Challenge #028 A Picture is Worth a Thousand Words, sponsored by Copic, is to use a photo on your card combined with JustRite stamps, to make a one-of-a-kind greeting card! Alternatively, you may also make a scrapbook page since the logistics are virtually the same! You might want to use this challenge as an additional opportunity to work out a family photo Christmas card design, too! I thought this would make a nice little love note to my girls! I started by printing my photo at 3.50" x 5", trimmed it with a Victorian/deckled blade, then mounted it to a standard A2 sized (4.25" x 5.50") card base of kraft cardstock. The shells on the frame were colored with Copic E01 marker. The frame was popped up on foam tape over the photo and tied with some ribbon & twine. And there you have a very quick and easy photo greeting card! The challenge winner this week will receive a set of 12 Copic Ciao markers (colors may vary from photo), compliments of the North American distributor of Copic markers, Imagination International, Inc. Thanks, Copic! And three Honorable Mention winners will each receive a $15 JustRite gift certificate! You will then need to link to your project back here on our blog post, using the linking system on this challenge post. Please make certain your link is directly to your project, not just your general blog home page or overall photo gallery, so we can find it easily. (Links that are spam, commercial in content, or are not linked properly/directly to your project will be deleted). If you choose to upload your project to www.Splitcoaststampers.com OR our Flickr gallery, please use the weekly challenge code (example: JRC_028 <== that's an underscore between the letters and numbers) in the keyword section of the Splitcoast project upload page or the Tag section of the Flickr gallery. You will have until next Thursday, July 29 by midnight Central to make your project and enter a link to it below. Then the winners will be chosen and announced a little later that day here on the JustRite Inspiration Blog. By entering our challenges, you grant JustRite Stampers permission to use your artwork here on our blog as well as our company website gallery (with designer credit given and your blog post or gallery linked) or any possible advertising. We can't wait to see your photo cards! Please note that you'll have a little longer this week to play along in our challenge — until midnight Central next Thursday night, as we'll just be returning from the Craft & Hobby show then and won't be able to announce the winners of this challenge until sometime Friday, July 30th. JustRite Friday Challenge 027: Christmas in July Winners! Sorry to be a little late in announcing our JustRite Friday Challenge #027: Christmas in July winners today … we're deep into preparation for the Craft & Hobby Association trade show in Chicago next week! If you'll be attending the show, please be sure to drop by booth #1800 and see us there! For Best Home Decor — Sheri Holt with this wonderful wall hanging she made from CDs! Sheri used our 95-point Times New Roman Uppercase font to spell out Ho, Ho, Ho! Pam used our new Groovy Snowman set for her cards AND a wonderful container to give them in — you really need to click over to her blog to find out what round container she recycled! Selma also used our Groovy Snowman set for the fabulous inset on her box. Click on over to Selma's blog to see how she customized the pretty oval embellishment … very creative! Joan used our Holiday Demi Phrases for her "sending holiday joy" border and then Joyful Hearts for the center of her beautiful medallion. See why we had such a hard time deciding? Fabulous projects, everyone! Congratulations, ladies … please email me, to claim your gift certificates! We hope you'll check back tomorrow for another JustRite Friday Challenge! 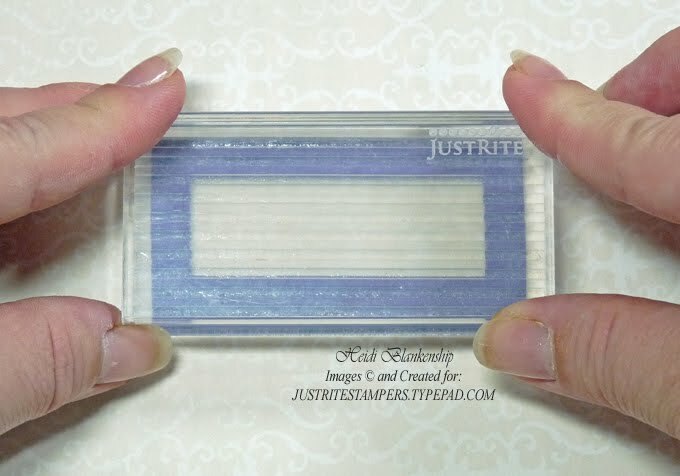 When I found out JustRite Stampers was going to include Clear Stampers in the New Product Line I was so excited! Working with Clear Stampers opens up the door to so much more creativity and versatility. 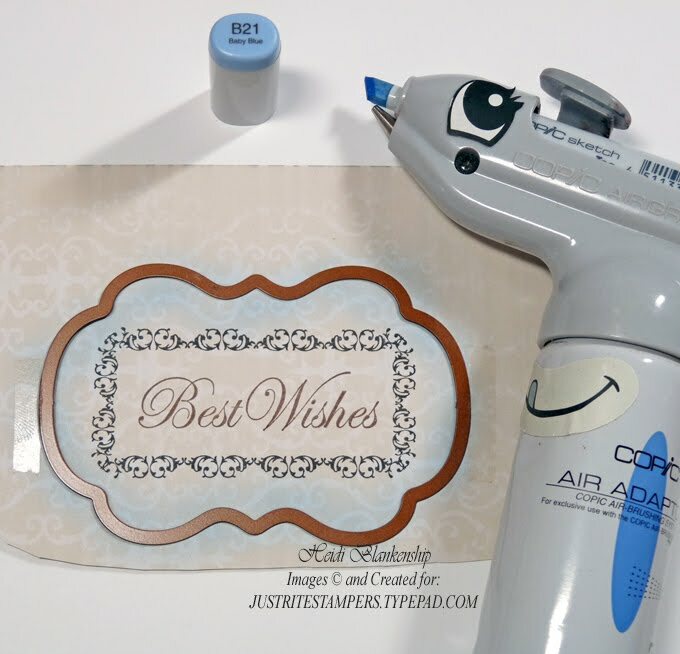 For today's Tuesday Tutorial I have created a card using one of the new clear stampers from the JB-09520 Clear Horizontal Stampers-2 pack and stamps from JB-09205 Victorian Nested Frames. 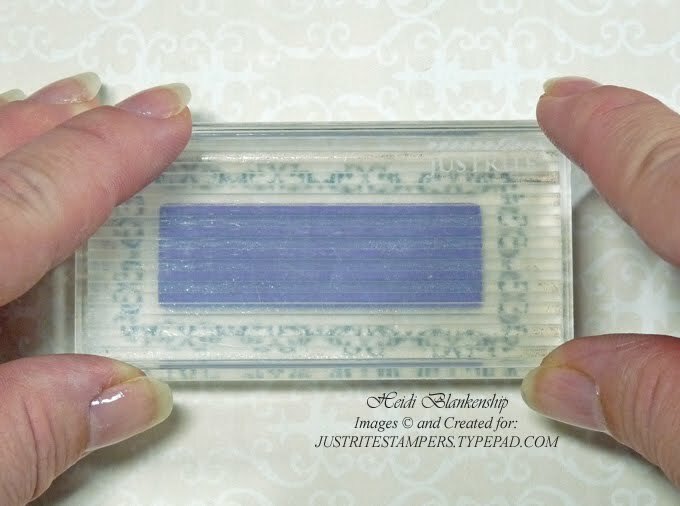 I will show you how easy it is to stamp with the new Clear Horizontal Stampers and you can even add two colors of ink. 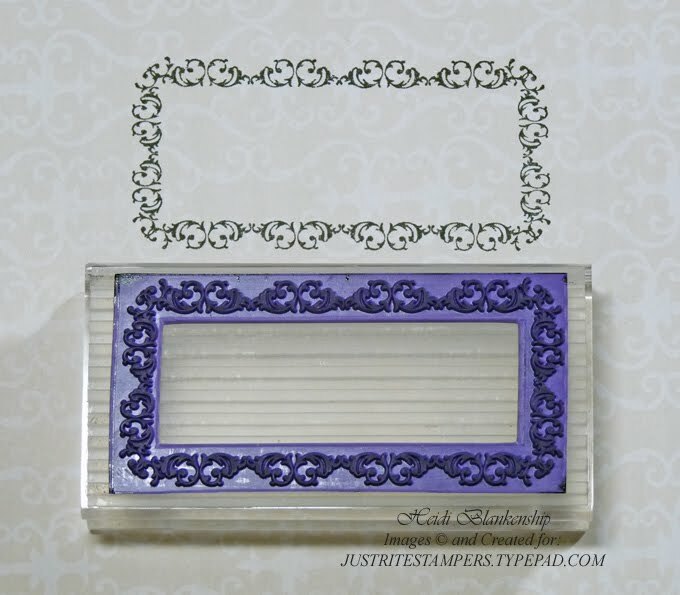 Start with the smaller Clear Horizontal Stamper, 1-5/8" x 3-1/2" and the small frame from Victorian Nested Frames. Ink the frame with Tuxedo Black ink and stamp onto the L'Amour paper. This is what the frame will look like. Next remove the frame and add the sentiment to the center of the Clear Horizontal Stamper. Ink the sentiment with Rich Cocoa ink and stamp. Because the stamper is clear and it also has the grid lines it is very easy to see and be able to line up images for perfect placement. Here is the result, a beautiful frame and sentiment with two colors of ink. I taped the S4-290 Label Fourteen Die #4 in place and then cut/embossed to create a label diecut. Leaving the paper in place airbrush with Copic marker B21 Baby Blue around the outer edges. Remove the paper from the die template. Here is a close-up of the label. I made a tag diecut with the L'Amour paper using S4-235 Fancy Tags and airbrushed it with the same Copic marker as mentioned above. The card base is Belgium Blue cardstock from WorldWin and then I layered black cardstock and Tresor paper for the mat. 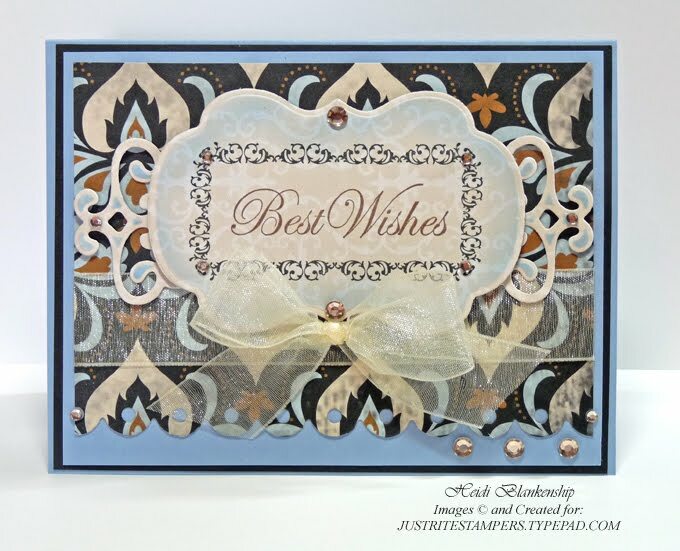 I created a scalloped edge on the Tresor paper using the S4-239 Classic Scalloped Border Petites die template from Spellbinders™. The tag and label diecuts were layered using 3D Foam Squares from SCRAPBOOK ADHESIVES By 3L™. For a finishing touch I added a bow with sheer ivory ribbon and brown rhinestones. We hope this article will be a helpful reference for using the Clear Stampers. Please let us know (by commenting on this post) if there are other questions or tutorials about JustRite's stamps you would like to see answered and we'll try our best to comply! 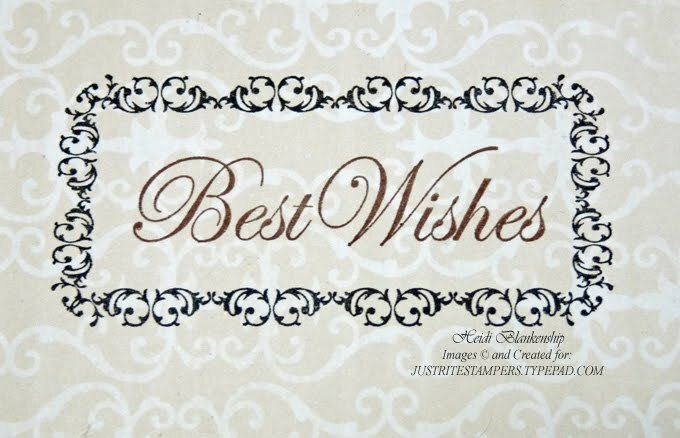 Hello and welcome to JustRite Stampers' Christmas in July blog hop! Today, our designers will be showcasing our Christmas Collection I release (yes, there will be a second collection released soon)! We hope you will be inspired by each of these fabulous and unique projects, and gain some wonderful ideas to get started on your holiday cards and projects! I started by lining up the 95-point Times New Roman Uppercase font letters to spell out "MERRY" on the largest Horizontal Wood Stamper (which measures 2-3/8" x 5-1/2") and then I positioned the 8 Holiday Cheer images around the letters. The piece was die cut and matted, the edges inked, and then red twine sewn into place. The finished piece was layered onto a 5" x 8" piece of white chipboard, covered with red snowflake paper. I used 1/4" double-sided tape around the edges and glittered it with black glitter. This sign can either be displayed on an easel or holes punched in it and hung with ribbon. Before we get started with today's challenge, we want to let you know that our brand new 1-5/8” Round and 2” Round CLEAR Stampers are now in stock in the warehouse and ready to ship! You can find them in our store, by clicking on the hyperlinked text above. Here we are with another challenge to help you get started on your Christmas projects! Hopefully, by making a some each month you'll have a good stash by the time late November or early December rolls around and you won't be scrambling! Either that, or you'll have a few good designs worked out and will be all set to get them produced quickly. So your JustRite Friday Challenge #027 is to make a Christmas card or some other Christmas project with your JustRite stamps! I stamped the center tree by inking the tree and border separately with red and green inks, and then stamped the ribbon border with brown ink. I love all the dimension this set has! Everything was colored with Copic markers (listed below) and die cut with Spellbinders Labels Three Nestabilities die, which matches the ribbon pattern perfectly! All the images in this set will also punch out easily with a 2-inch square punch (border) and/or a 1.25" square punch for the centers. The "Winter Wishes" sentiment is a border from this same set — I just inked one side of it and stamped it a few times in a straight line. JustRite design team member, Kathy Jones also has a Christmas inspiration sample for you today. Kathy used our sweet new Groovy Snowman set and says it was a little easier for her to get in the Christmas spirit because she's going through her Australian winter right now! 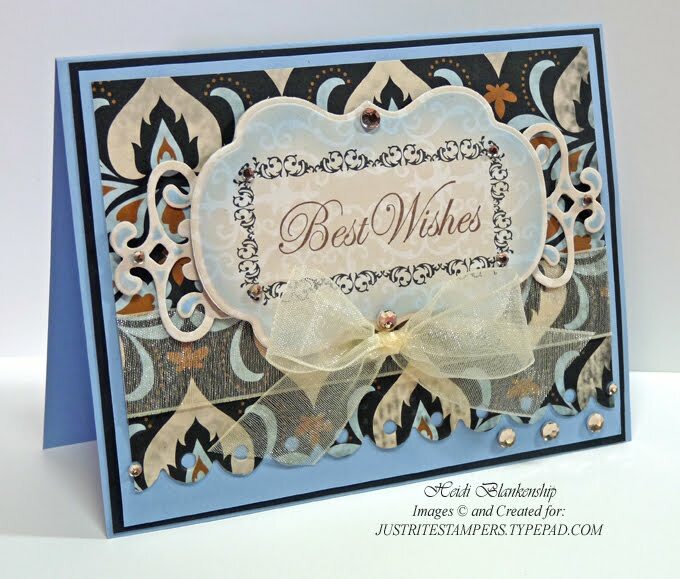 You can find all the details about Kathy's card by clicking over to her blog, Inspired to Stamp. This week's contest winner will receive a $50 JustRite gift certificate and three Honorable Mentions will each receive a $15 JustRite gift certificate. You will then need to link to your project back here on our blog post, using the linking system on this challenge post. Please make certain your link is directly to your project, not just your general blog home page or overall photo gallery, so we can find it easily. (Links that are spam, commercial in content, or are not linked properly/directly to your project will be deleted). If you choose to upload your project to www.Splitcoaststampers.com OR our Flickr gallery, please use the weekly challenge code (example: JRC_027 <== that's an underscore between the letters and numbers) in the keyword section of the Splitcoast project upload page or the Tag section of the Flickr gallery. You will have until next Thursday, July 22 at 9am Central to make your project and enter a link to it below. Then the winners will be chosen and announced a little later that day here on the JustRite Inspiration Blog. By entering our challenges, you grant JustRite Stampers permission to use your artwork here on our blog as well as our company website gallery (with designer credit given and your blog post or gallery linked) or any possible advertising. We can't wait to see your Christmas cards!